Daisy decided to dress up this year. Her costume? 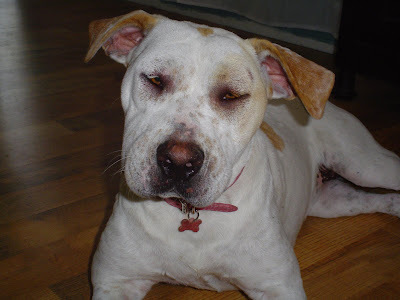 A dog who fights an ant and loses. She is just such a beautiful dog!....even with her boo boo's! 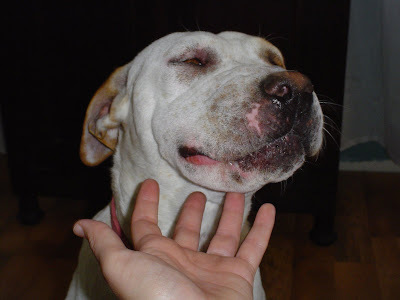 When I got home from work and let the dogs inside, my first thought when I saw her swollen face was, "Oh my god, the neighbor dog jumped the fence and attacked her." But after looking her over, I realized she didn't have any scratches and she had hives all over her legs. I rushed her to the vet and was told that she was bitten by something that caused an allergic reaction. They pumped her full of steroids and now she's fine (and she doesn't look hideous). And actually, now that the swelling has gone down, I can see where she was bitten. It looks like she was maybe eating a spider and it took a good chomp out of her!